Digidesign brings the unmistakable warmth and punch of analog tape into the digital domain with Reel Tape Suite™. This powerful collection of three plug-ins — Reel Tape Saturation, Reel Tape Delay, and Reel Tape Flanger — is designed to beef up your mixes and add that elusive magnetic vibe to your live sound, without the hassle of actually owning and operating a reel-to-reel tape machine. Add the richness of analog tape recordings and tape effects to your digital recordings or live audio easily and realistically with Reel Tape Suite, a collection of three plug-ins to warm up digital sound. All of the plug-ins feature streamlined interfaces with intuitive controls that are easy to work with, day in and day out. Whether you’re a professional audio mixer, musician, or live sound engineer, Reel Tape Suite brings the vintage sound of analog tape to digital audio while providing all the advantages of today’s state-of-the-art digital effects processors. Re-create the classic analog recording experience. Reel Tape™ Saturation emulates the color characteristics, tape compression, and saturation effects of popular analog tape formulations, including the classic Ampex 456* and higher-output Quantegy GP9*. It also features carefully modeled characteristics from renowned tape machines such as the 3M M79* and Studer A800*. Enjoy full control over tape speed, hiss, bias, and calibration levels — and forget about cotton swabs, rubbing alcohol, and razor blades! * Digidesign Reel Tape plug-ins are not connected with, or approved or endorsed by, the owners of the 3M, Studer, Ampex, or Quantegy trademarks. These names are used solely to identify the products that were modeled to create the Reel Tape plug-ins. Psychedelic, Dub, and Electro music styles are hotter than ever, and the warm, ear-pleasing sound of tape-based delay has never been more relevant. Reel Tape™ Delay emulates analog tape echo and delay effects with expertly modeled frequency response, noise, wow and flutter, and distortion characteristics. Reproduce fluctuations in tape speed — both small and large. Even get the full effect of adjusting tape speed during the record/playback process. Delays are fully adjustable over a wide range, and because EQ and detailed level control are built into the echo/delay loop, the feedback controls allow you to dial-in a variety of effects, from tastefully subtle to over-the-top. The reason why most flanger effects sound unconvincing is because the studio technique that they imitate is dependent on so many real-world factors. 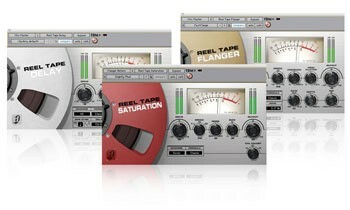 Reel Tape™ Flanger thoroughly models the tape flanging process and hardware characteristics, and provides an arsenal of controls for shaping the output in real time. The results are as close as you can get to the real thing — and a lot easier to use! The sonic characteristics of frequency response, noise, wow and flutter, and distortion are captured in detail and applied to a variety of tape speed and delay control options. Infamously difficult manual flange and artificial double-tracking (ADT) techniques are simple to re-create. Simply adjust the variable delay manually (or use the LFO and Depth controls) and listen to the captivating frequency sweep and “crossover” cancellation effects heard on so many classic recordings. You also get easy access to tape speed fluctuation and feedback controls.